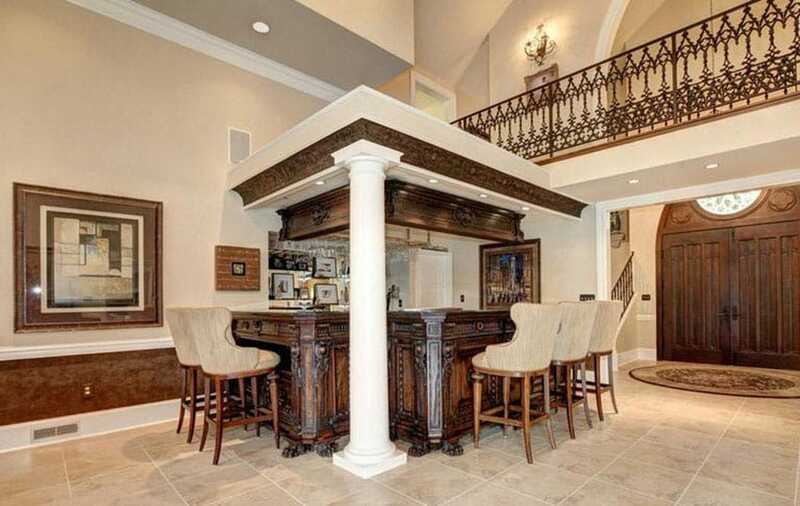 This gallery features luxury custom home bars design ideas and pictures. 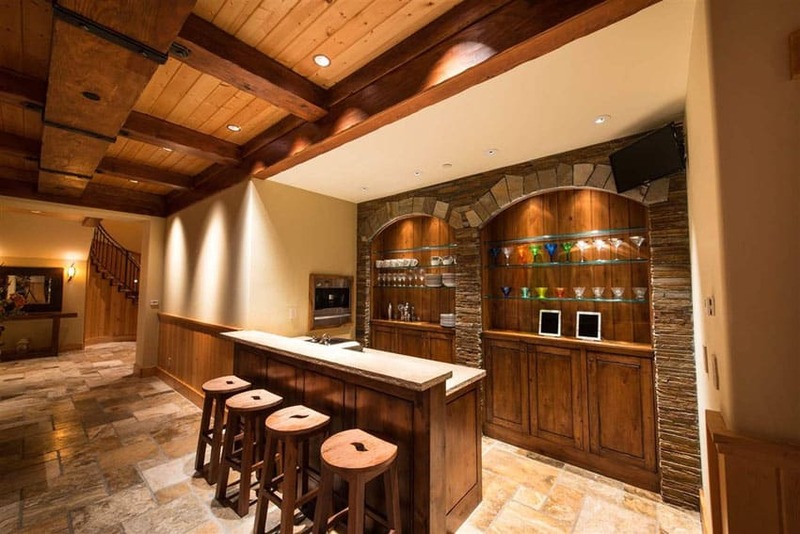 A custom home bar can be the ultimate place to relax after a hard day at work or just unwind with friends and socialize. 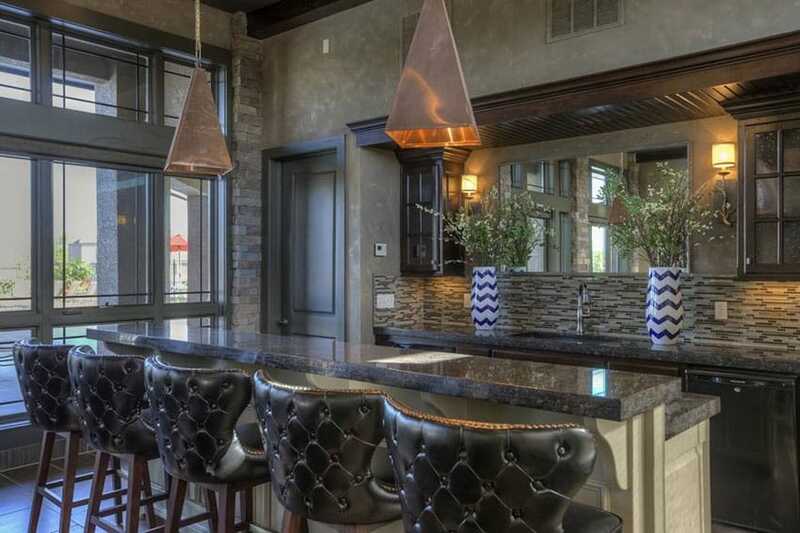 Here are 37 custom home bars that are sure to impress and give you plenty of ideas and inspiration for creating your own relaxing spot to enjoy with friends and family. 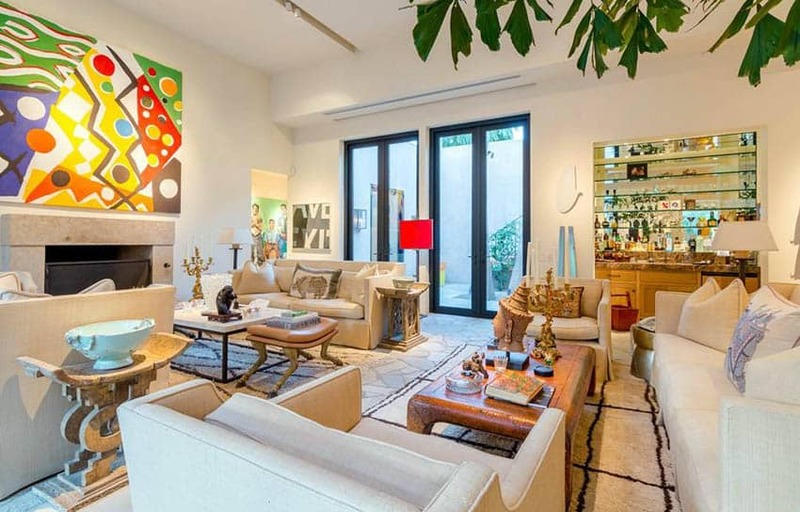 Class and elegance are the main motifs of this spacious interior. The lighting fixtures serve a two-fold purpose as a functional source of ample light as well as interesting accent pieces. The geometric pendant lights runs parallel to the theme of lines and solid forms used in the space. 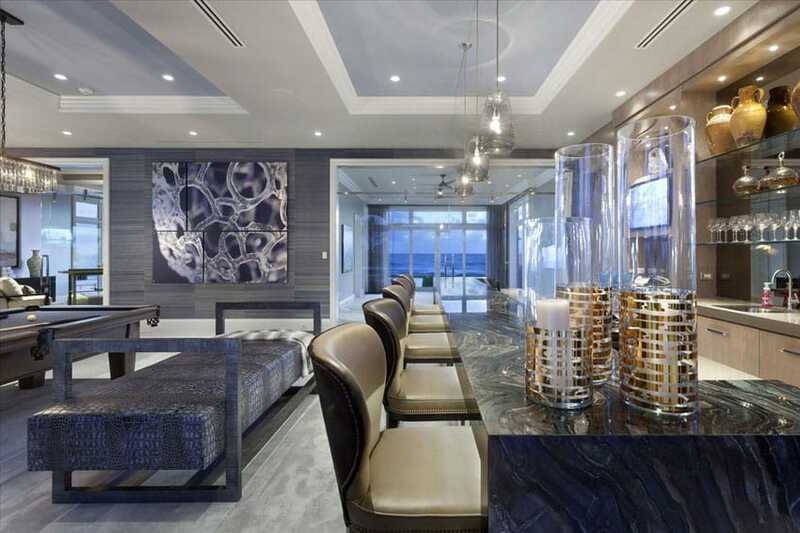 The wall sconces help frame the marble counter bar which serves a center piece for the lounge space. The blacks and grays of the furniture make for a good contrast to the rest of the room and the carpeted floors and glass and steel tables keep the room light and properly proportioned. The almost random arrangement of the tan travertine floor tiles seems to give life to the floor of the space. Accent walls are lined with same arrangement of stones, but with an added variation in texture and color. The dark wooden cabinetry, shelves, and furniture serve as good contrasts to tone down the lightness of the space. The intricate gray moldings of the dropped ceilings seem to frame the different parts of the space. An example of bold and simple design, this space uses a juxtaposition of brown and white colors to help drive its point home. The wooden teak floor boards, cabinetry, furniture, and counter top help give a welcome warmth to the space. The dark, rich colors of these features are pleasantly contrasted by the mellow, light colors of the walls and the ceiling. The playfully bright-colored upholstery of the wooden bar stools give an unexpected pop of color in the space. The traditionally tasteful use of polished wood for the counter top is a design choice that has several aesthetic merits. The careful arrangement of display pieces on the bar shelves is integral in the overall feel of a home bar. The dark brown of the bar stands out amidst the beige walls and floor boards. 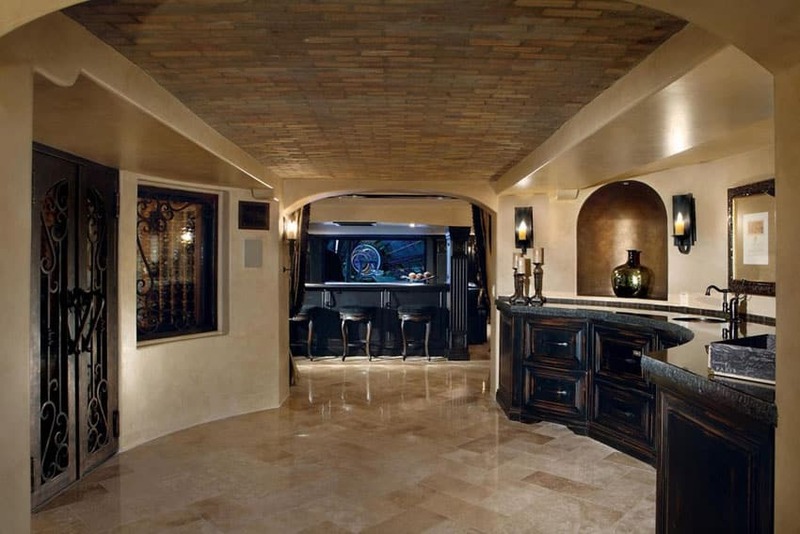 The basement flooring features traditional wood planks for the bar area and a laminate for the downstairs kitchen area. This space employs an eye-pleasing mix of striking colors. The wide windows appropriately let much light in to showcase the color palette of the room. The mellowness of the yellow ceiling, the anchoring dark brown of the bar area and walls, and the unique use of green carpet creates a color combinations that is absolutely lively and adventurous. The ornate patterns on the upholstered wooden chairs, the intricate patterns on the carpet, and the floral lighting fixtures used on the paneled ceiling further adds to the space’s charming variety. 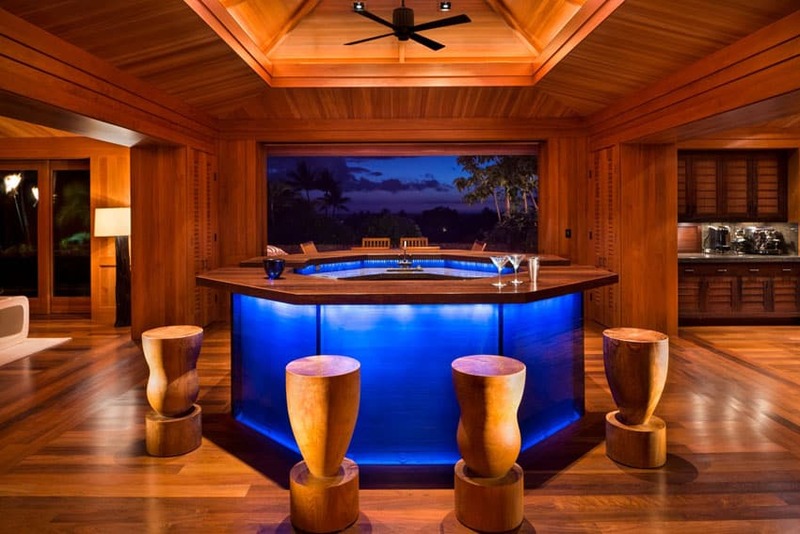 This bar design appears very clearly was designed for its context – cool, tropical nights. The lit blue bar counter parallels the deep azure of the early evening sky. A bold use of solid carved wooden bar stools, teak wooden floor boards, and teak wooden planks for the walls and ceiling, helps accent the blue of the bar and the vista seen through the large doorway that frames the outside. 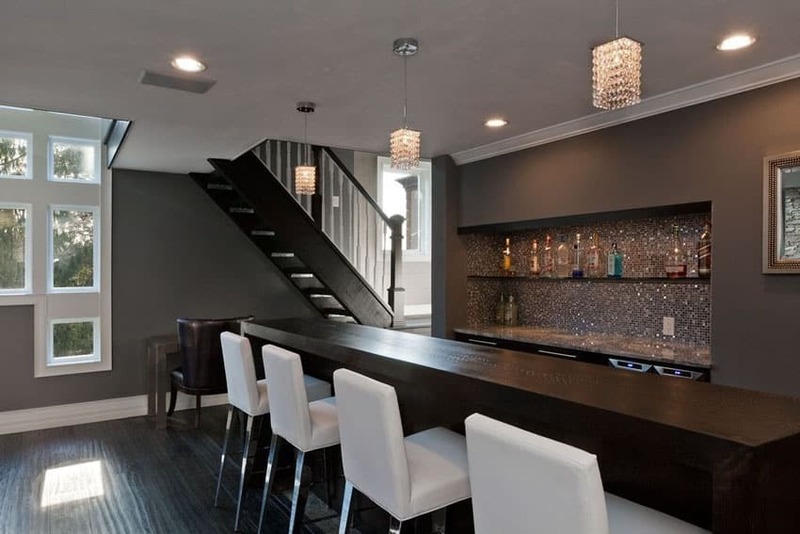 Minimalism was used in the forms and details of this home bar design. It keeps it feeling easy and comfortable to be in. Stone counter tops and white and gray wall tiles go well with the dark grey cabinetry and shelves. The wooden floors and gray-painted dropped ceiling makes the space look visually and aesthetically balanced, important in making a place feel like home. The spotlight of this piece is the dark marble used on the counter top and bar. The material is complemented by the bold design of the bar stools, art installments, and displayed bar accessories. The dark wooden back wall also creates a good contrast with the plain white ceiling, walls, and floors. The white leather bar stools mix well with the gray marble counter top. The grays and browns of the carpet, floor, and brick wall add a good strong vibe to the space. The most interesting piece of the design is its industrial copper chandelier above the bar; it goes to show that lighting does more than just illuminate an area. This design was intended for more personal, private occasions. Banquette seating, like the one used in this design, provides plenty of seating space for the relatively small room and the circular bar tables make for an intimate and cozy aesthetic. Smart use of the pendant lights adds to the overall charm of the place. The window placement also prevents the place from feeling stuffy. 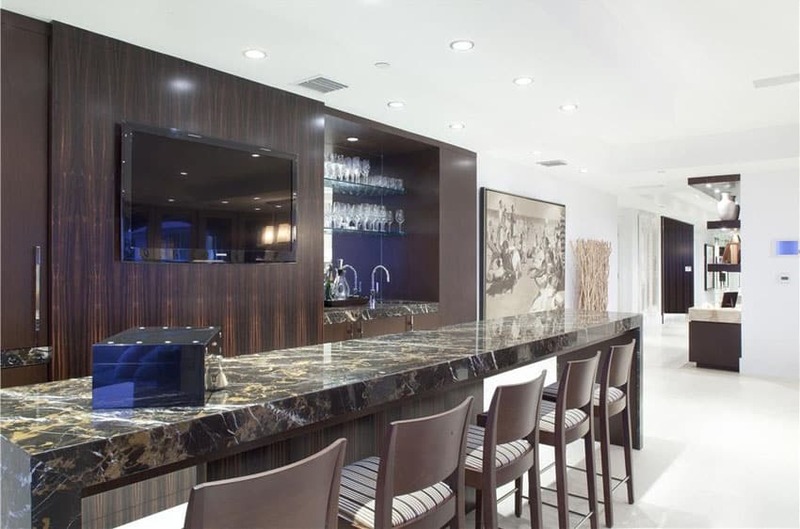 Black granite is used for the countertops and help give this custom home bar a sleek and sophisticated style. An example of modern, minimalist design, this home bar employs bold, plain lines and edges to create a space of exquisite sophistication. The block colors of dark brown, gray, and white also add to its air of classiness. 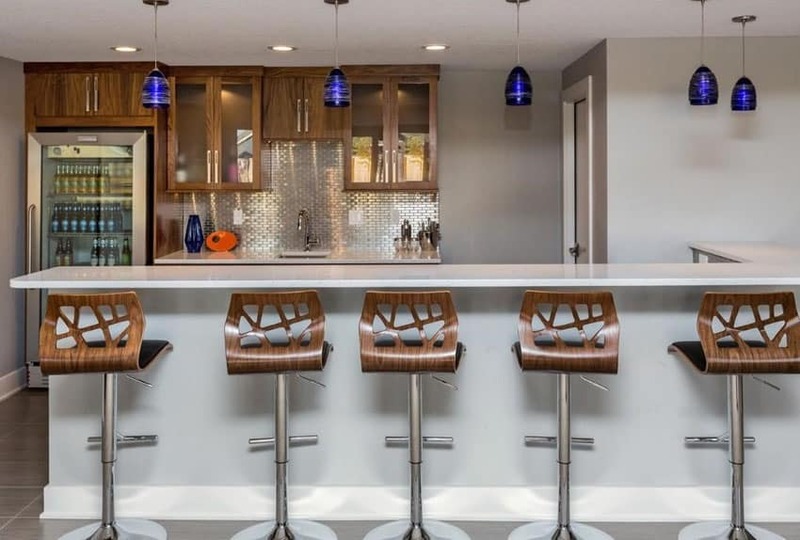 The leather bar stools, the solid wood counter top and the simple yet stylish pendant lights are all smart design choices that help this minimalist home bar achieve its full potential. 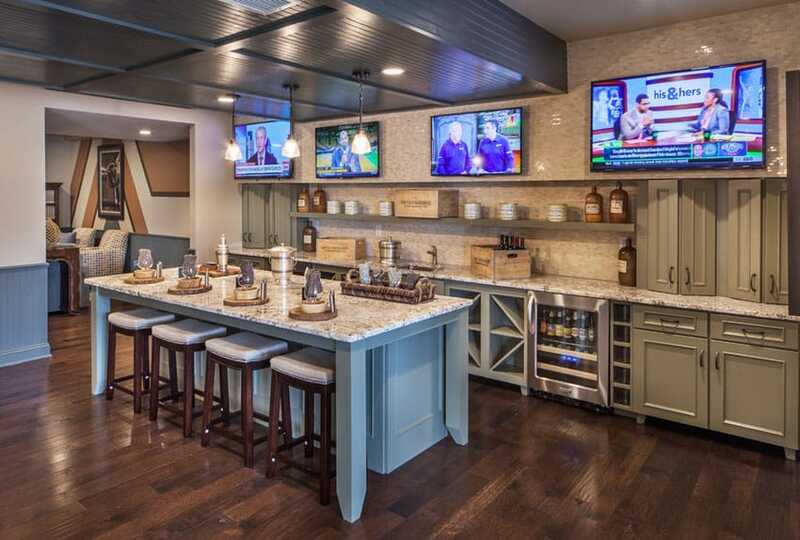 The contemporary mosaic tile backsplash helps frame the bar area to showcase expensive liquor and keep your mixing apparatus in an easy to reach location. The design of the bar stools and the eccentric colors of the pendant lights serve as the centerpieces of this design. The solid white quartz stone counter tops with the wooden cabinetry work help lighten the overall feel of the room. The metal back splash tiles used at the sink area add another splash of contemporary charm. This spacious design is a good example of classic design integrated into modern-day. From the ornately designed upholstered bar stools to the intricately carved wood of the fireplace, the generous use of wood and quality workmanship gives the space class and style. Large glass windows make sure that place feels open and bright while the fireplace located at the side opposite the bar top off the sophisticated ambiance of the design. The high coffered ceiling provides a feeling of luxury and elegance to the room. 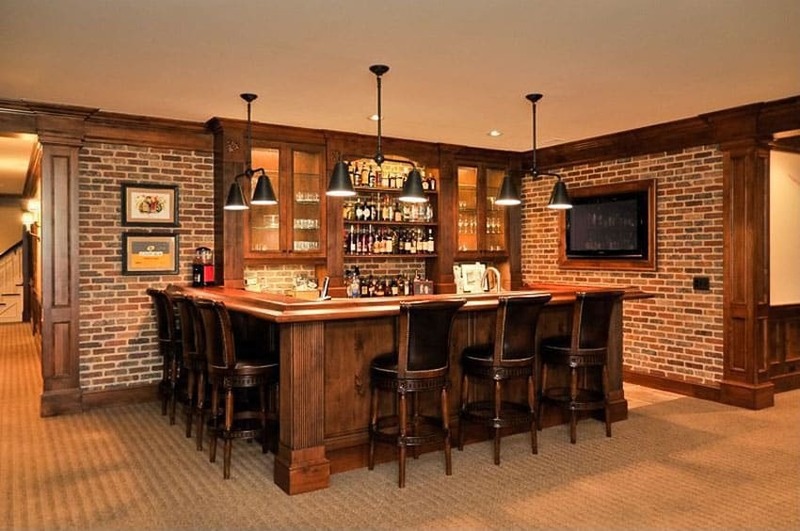 Brick walls are used to add warmth to a space and this example of a home bar is a prime example of brick walls used right. The smart use of rich wood, carpeting, and industrial lighting fixtures keep the place feeling rustic and comfortable. An interesting use of a wooden a picture frame can be seen in the space – as a frame for a flat screen television. This is a good example of innovative, out-of-the-box design. Ceilings are commonly underappreciated aspects of interior design. However, in many ways, ceiling design can make or break a room. In this example, brick was used as a ceiling cover. This adds an intimate ambiance to the space as well as showing ingenuity in its use of building materials. 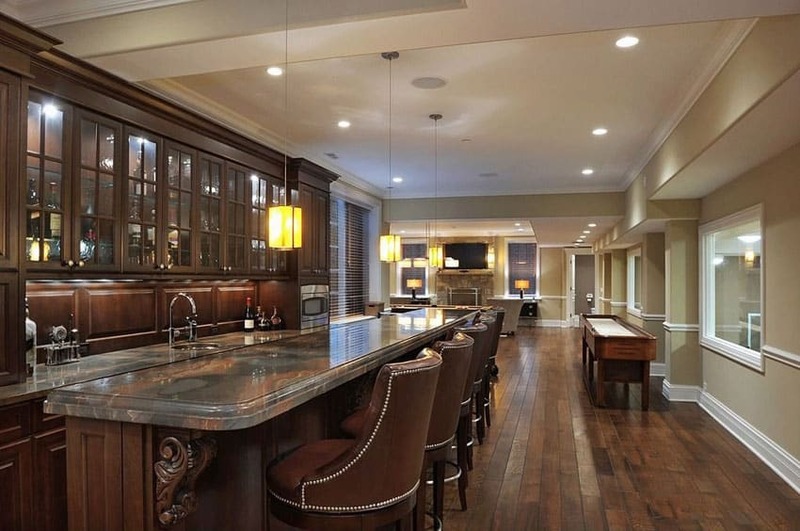 This, coupled with the black stone counter tops, dark wooden cabinetry, and polished stone floor tiles, give this home bar class and style. A single room can serve more than one purpose in a house. 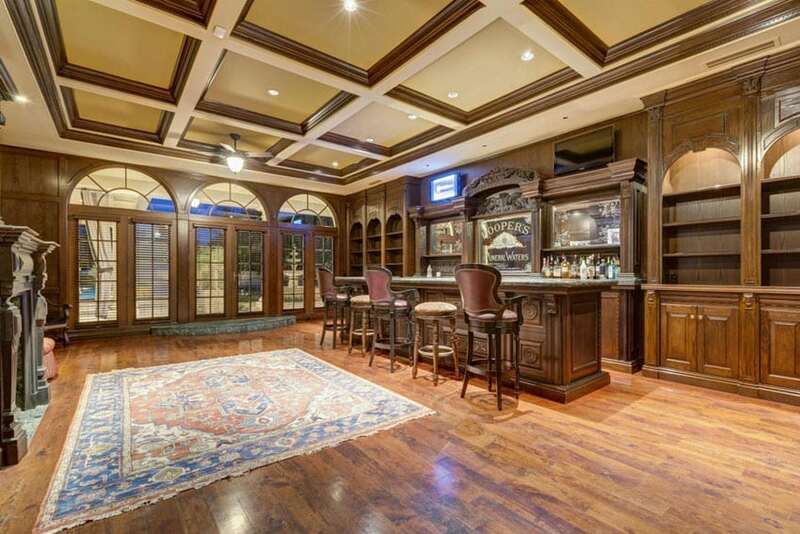 This home bar is organically built into a home theater room. 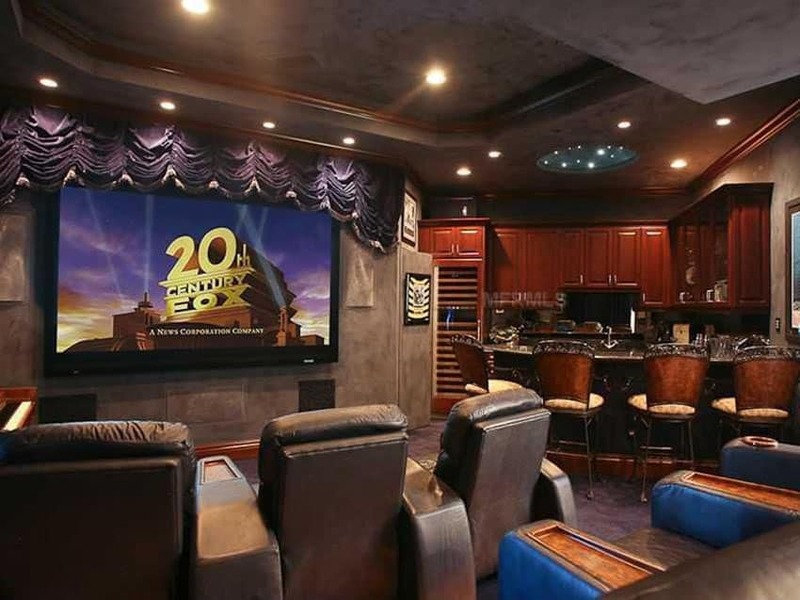 An arrangement like this is an example of smart design that combines two different spaces – in this case, a home bar and a home theater – to create an area that is unique and inspired. 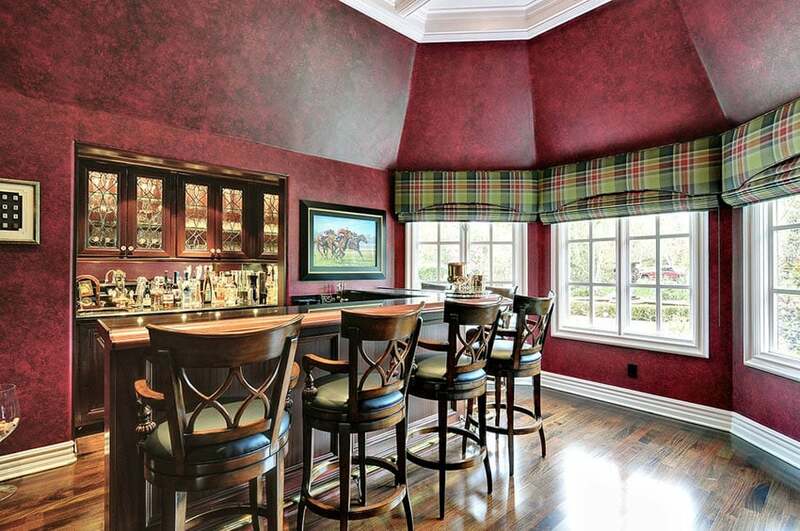 Wide windows, such as the one used in this home bar, make spaces feel spacious and welcoming. 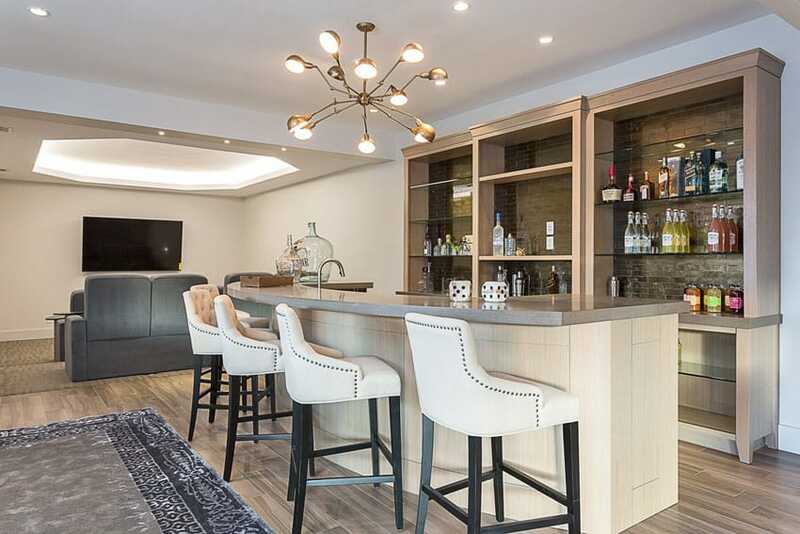 They invite sunlight into the room and, coupled with the warm gray painted walls, the stone tile back splash and counter tops, the brickwork on the column, and the tufted leather bar stools, this space makes you feel right at home. Color is everything in designing a space. This home bar utilizes its striking speckled red walls and white wall baseboard to give itself an aesthetic that is unique and stylish. The plaid-patterned green and red curtains further liven up the space. 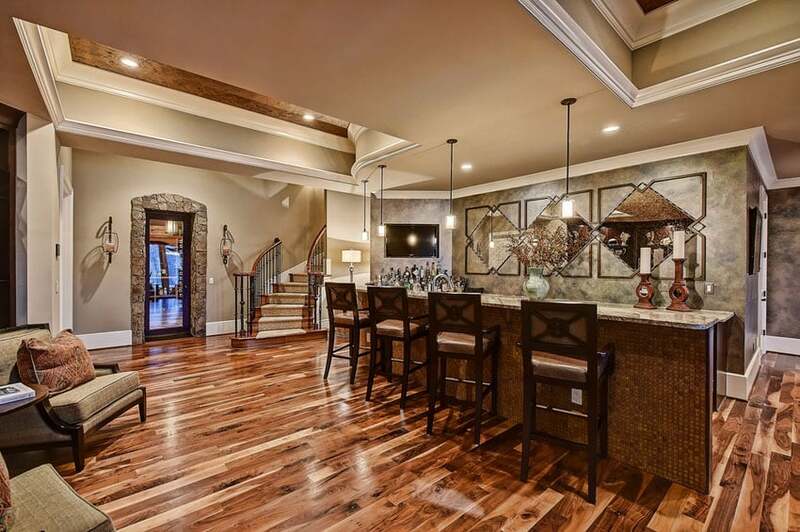 The polished hardwood floors as well as the wooden counter top and bar stools give the design a warm, welcoming feel. Colors and materials are not the only things that can play around with contrasts; textures can also be utilized to define a space. 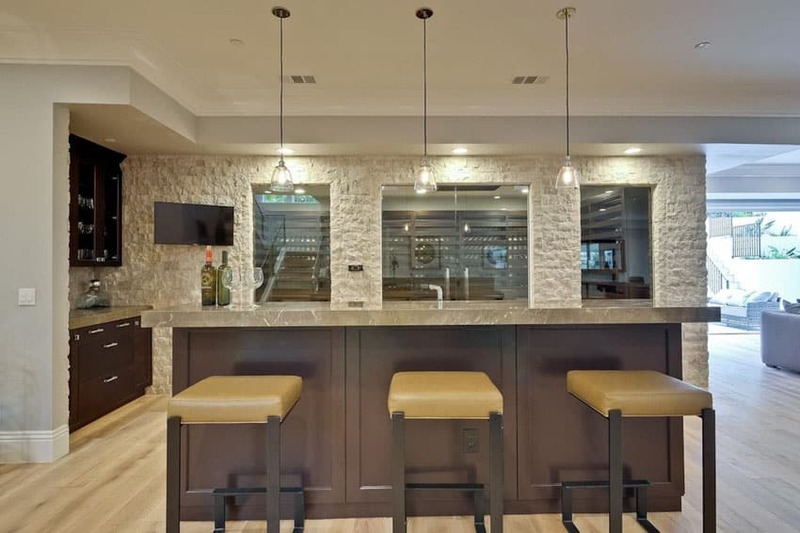 The smooth flat surfaces of the white walls, wooden floors, stone counter top and bar stools are pleasantly contrasted by the rough stacked stone look of the bar’s back wall. This home bar is integrated into the home’s main living space. This type of design, when done right, greatly enhances the overall feel of a home. The stone surfaces, plain white walls, limestone floor tiles, and the quaint furniture, all topped off with warm white lighting, makes this into a warm yet stylish place to entertain. As a material, glass is known for its delicateness and sophistication. And when used intelligently, it creates unique and beautiful spaces. 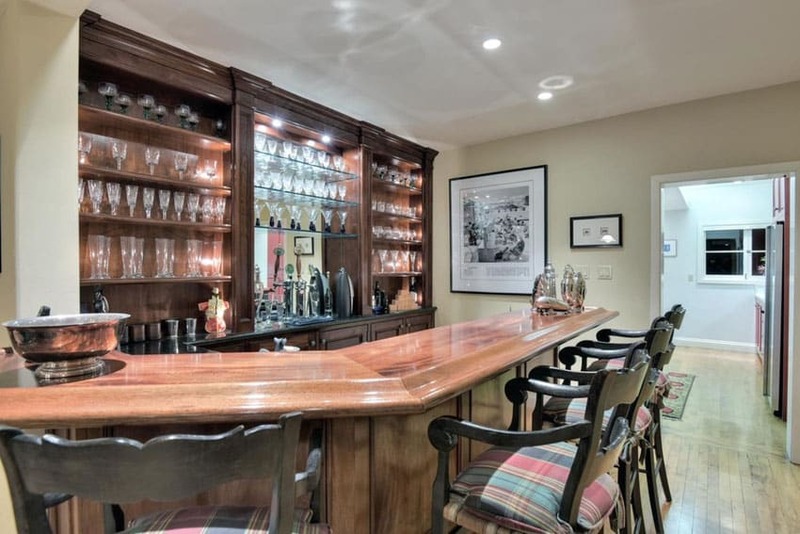 This home bar is an example of such use. 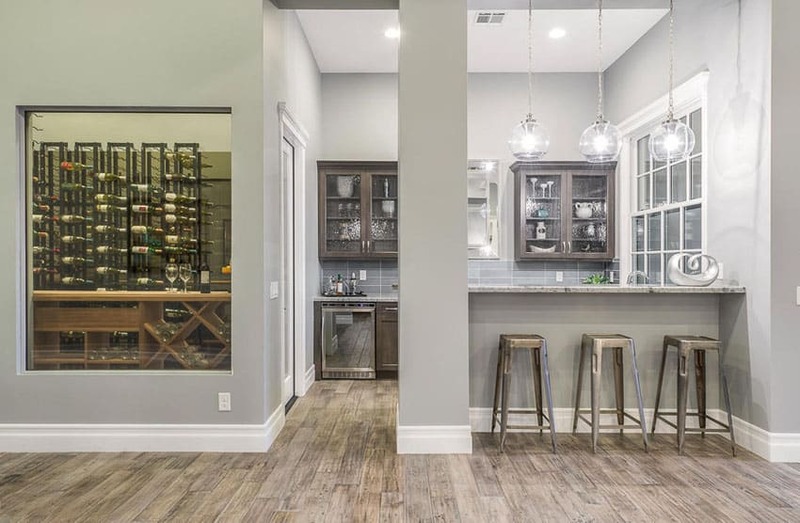 The industrial fixtures and furniture coupled with a glass display window for the homeowner’s wine collection makes it a home bar that makes a point to display its intricacies sincerely and beautifully. The cabinetry with framed glass doors, the white framed glass window at the far end of the bar, and the glass orb lighting fixtures light up the place even further. 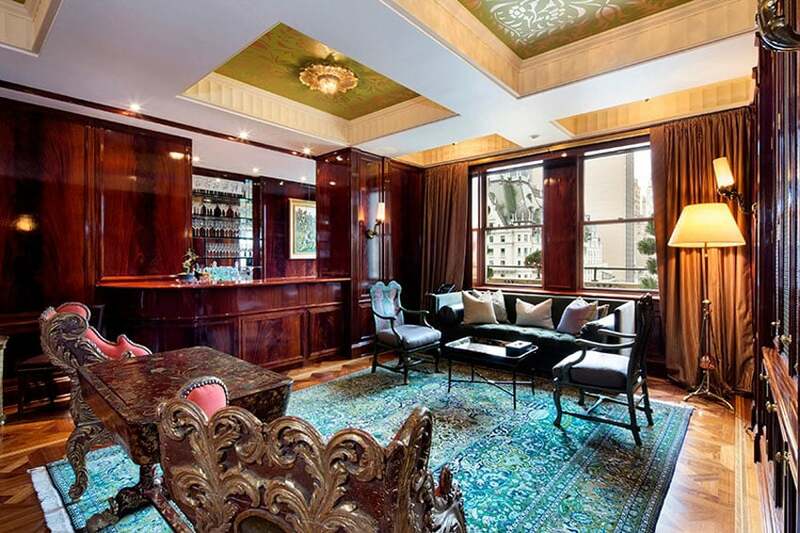 Cool spaces exude feelings of class and elegance. This seaside bar and lounge mirrors the cool, calm appeal of the ocean with its large glass doors that frame the view of the sea outside. The space uses cool gray and black colors on its features – dark walls, grey floors, and a black stone counter top – which all work well together. The tasteful painting hung on its main wall and the stylish leather seats are a nice final touch on its aesthetic. Consistency in materials and colors are usually popular choices for finishes, but there is merit in breaking consistency in design. In this design, the wooden floors have wood grains and patterns of varying degrees of darkness which pair well with the choice of furnishes for the mosaic tiled bar. The choice of décor adds an industrial yet homey classiness to the space. This space took advantage of the counter by using it to break the length of the bar. For homes, proportions of spaces are of utmost importance; the counter is oriented parallel to the depth of the room and is located at the middle which breaks the space and prevents it from feeling too spacious. The dark wood floors, brown leather bar stools, marbled counter top, and rich brown cabinetry all contribute to the intimacy of the space. Bars are usually located in rooms where the ceiling is not too high; however, this example proves that design truly has no limits. A lower ceiling was constructed on top of the bar area to circumvent the room’s otherwise unusually high ceiling. The design details of the space – the circular neo-classical column holding up the lower ceiling and the intricate carved details on the bar’s wooden counter and moldings – completes the rustic, almost Mediterranean vibe of the area. Bright reds are colors that attract most of the attention in a room. In this example, the couches and lounge chairs serve as the focal point of the room with their bold crimson color. The rest of the room appropriately complements the furniture with earth tones, stone tile flooring, stone walls and quaint décor creates a nice ambience in the space. 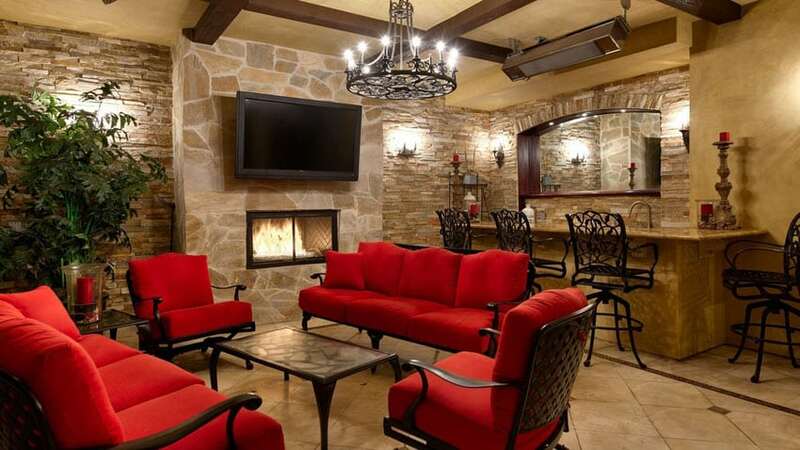 The stacked stone of the home bar makes a perfect compliment to the stone fireplace enclosure and travertine flooring. Storage space can be used not only functionally but also aesthetically; as in this design, the wine bottle holders that adorn almost all of the backwall serves as an interesting aesthetic. 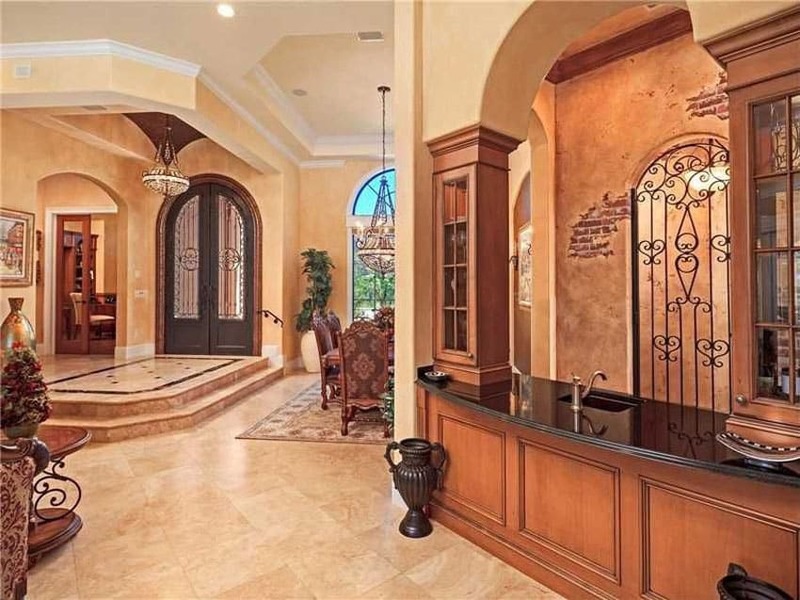 The sunken conversation pit appropriately placed right next to the counter and the fireplace creates a homey Mediterranean style vibe further accented by the stones and bricks used on the floor and walls. 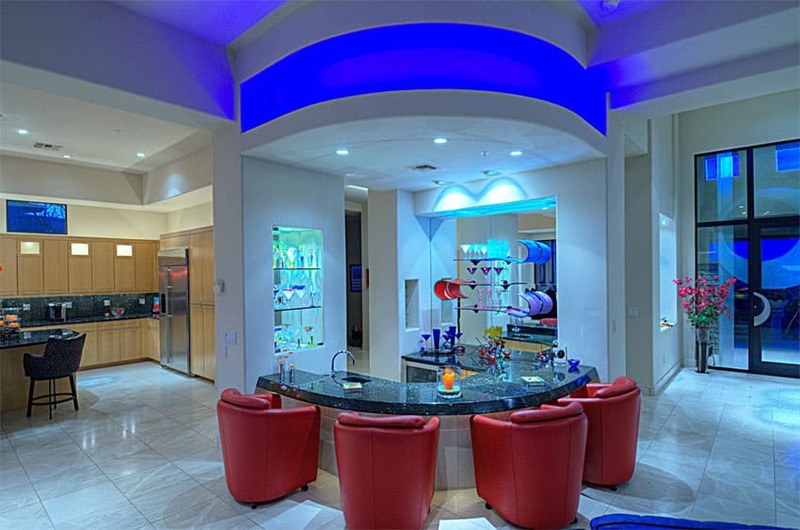 A modern home bar that uses contemporary pieces with bold colors to adorn its space. The dominant blue is balanced out by the bright red of the lounge chairs. With the quaint low-height curved counter top, this space feels clean, stylish, and comfortable to be in. 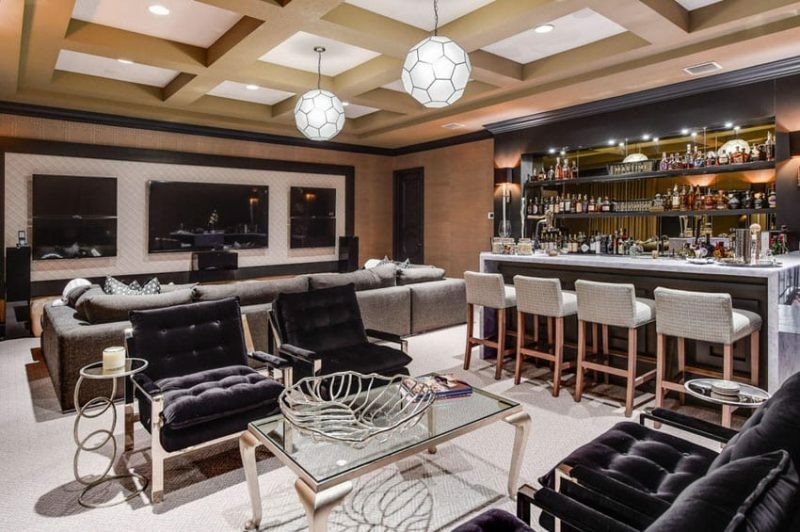 It is interesting to note also that the unconventionally low height of the bar counter top works perfectly with the red leather lounge chairs used as bar stools. 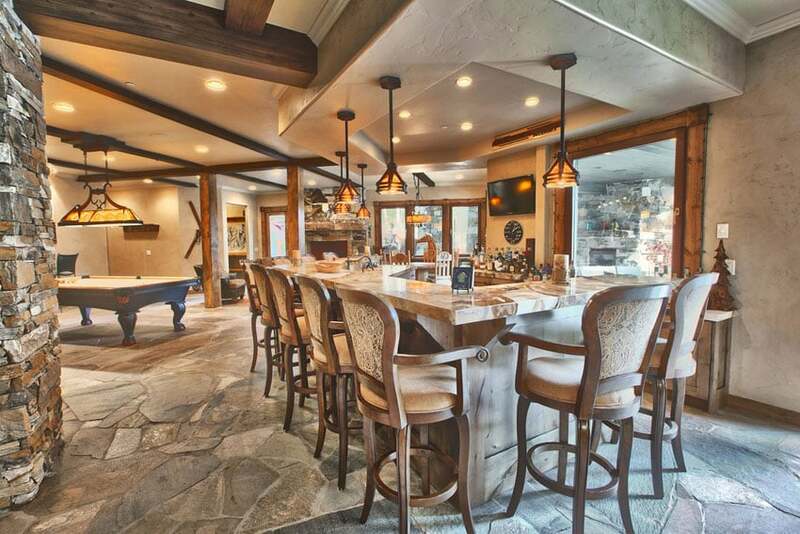 Custom home bars often make a big statement and this one is no exception. 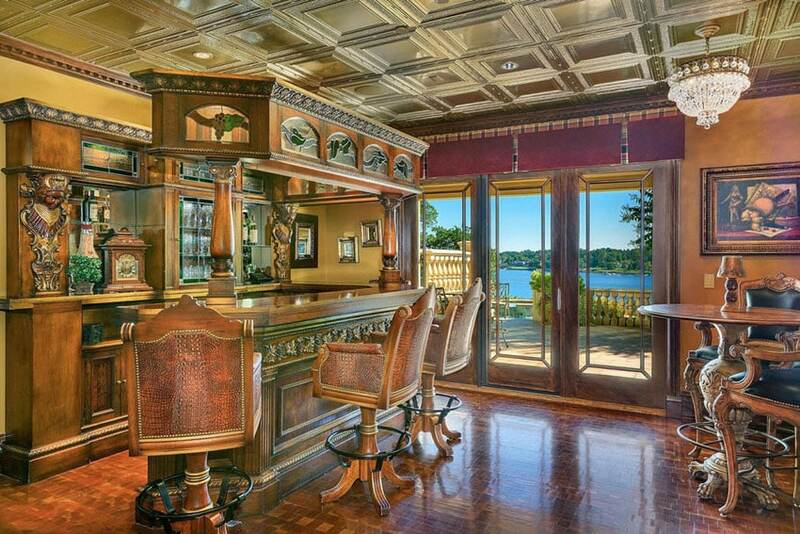 This black and purple home bar has generous amounts of mysterious charm and style. 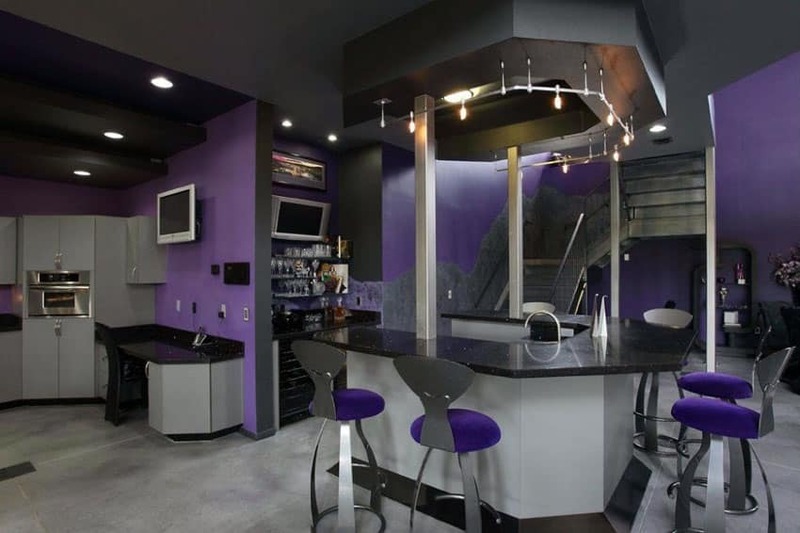 With its straight and clear-cut forms, plentiful use of stainless steel materials, and smart use of black paint with purple accent walls and upholstered purple bar stools, the futuristic feel of the home bar is topped off by the use of a center bar island. 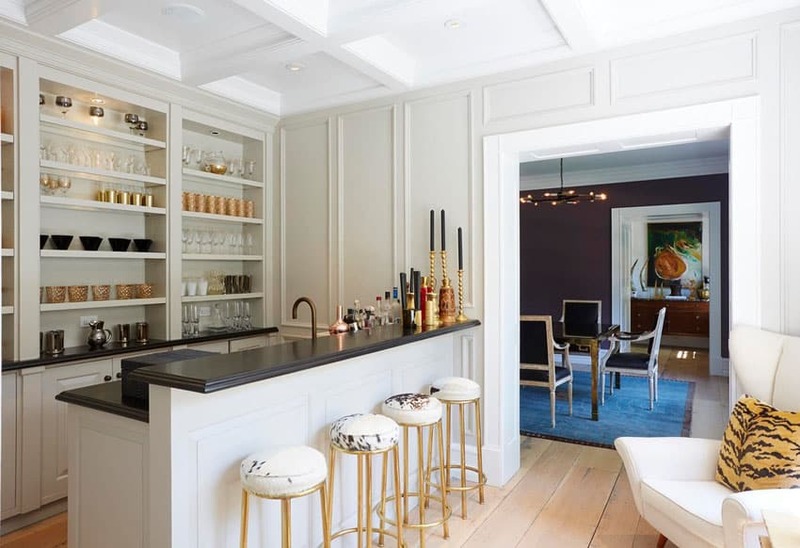 A small elegant home bar that uses its space intelligently with a juxtaposition of gold, white, and black to grab your attention. The jet black stone counter top and elegantly arranged golden and glass cups at the back shelf of the bar couple nicely with the choice of tiger striped furniture which adds a dash of wild personality to the space. The painted coffered ceiling continues the feeling of drama and elegance in this room. 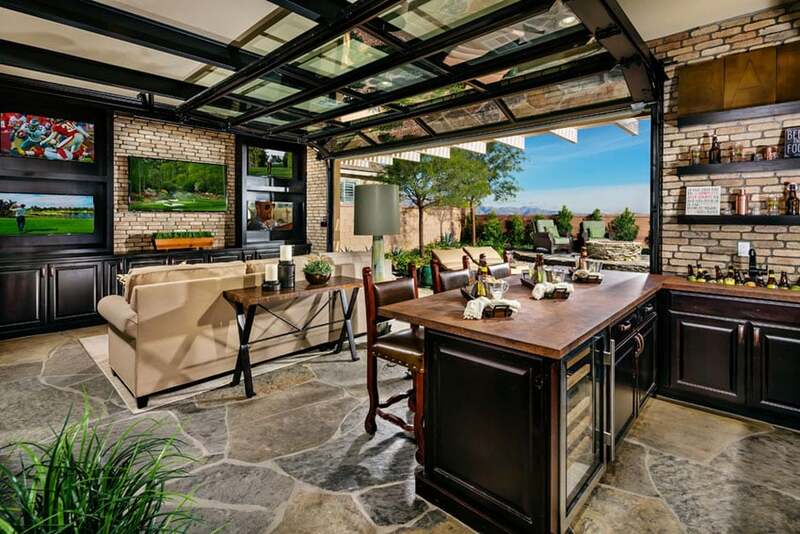 This home bar space uses a roll up glass garage-type door to open up its inside to the outside terrace. The use of broken stone flooring and brick walls further accentuates the melding between the inside and the outside. To top it all off, the smart use of dark wooden and leather bar stools, an industrial style side table, as well as dark brown stone countertop creates a nice interplay of materials and colors in the space. 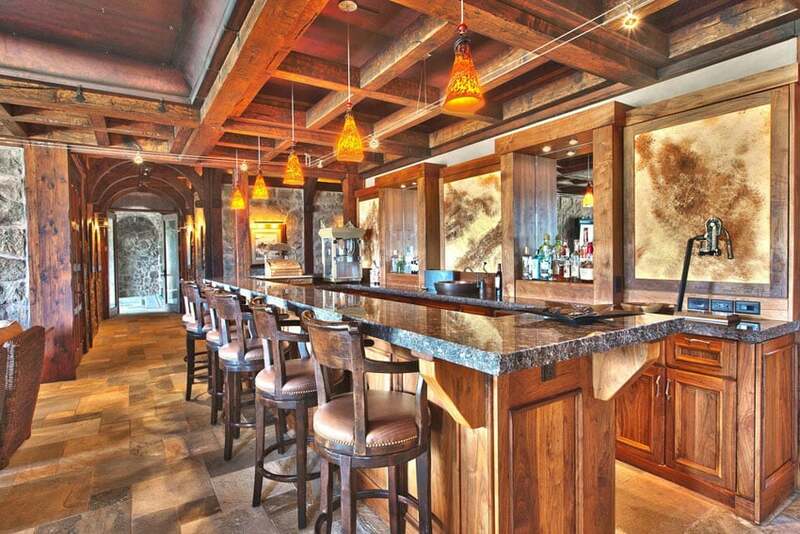 This custom rustic wood home bar makes smart use of wooden planks as ceilings and walls to help create a vibe akin to being on a ship sailing in sea. This design employs just that coupled with solid wood round bar stools, plentiful use of stone both in the walls and the floor, and a quaint lighting design that somehow showcases all of these features. Careful use of light is one of the paramount features of a space. In this example, the use of numerous wide glass windows help create a space rich with life and light. 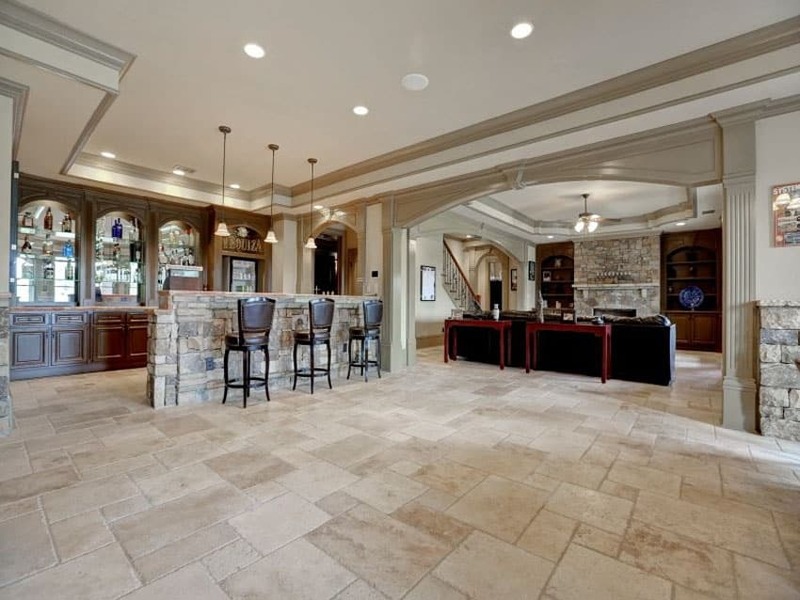 The use of stone in the floor as well as the central column goes exceedingly well with the use of the clean almost raw-like concrete finish of the walls and the ceilings. 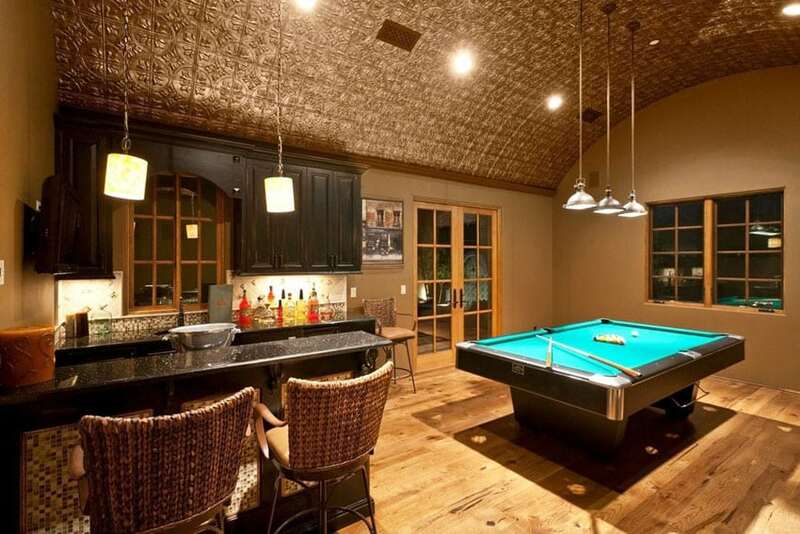 A feature also worth noting is the stylish use of industrial pendant lights for the bar counter area and the pool table. Overall, the design lets you feel as if you were in a quaint, cozy cabin in the woods. A blast from the past: this Victorian-inspired design employs features common in the grand, classy spaces back in the days. A small but nonetheless grand chandelier, ornately carved wooden seats upholstered with the finest leather, intricately carved patterns on the bar counter and moldings, and the art pieces – the tasteful painting hung on the wall and the carved busts located on the bar’s back wall – creates a space that is classically and timelessly stylish. In long spaces, the use of design features that segment the space are increasingly important. This bar used segmented parts of wall and shelving on its back wall to ease the proportions of its length. Stone tiles, wooden cabinetry, stone counter tops, and wooden beams creates a space that is welcoming, bright, and comfortable. 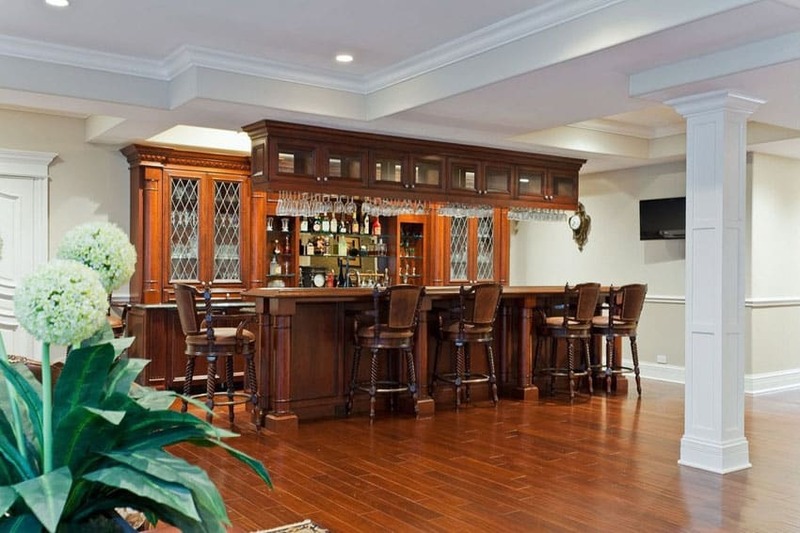 The rich wood cabinet of this custom home bar showcases the craftsman quality of its workmanship and attention to detail. 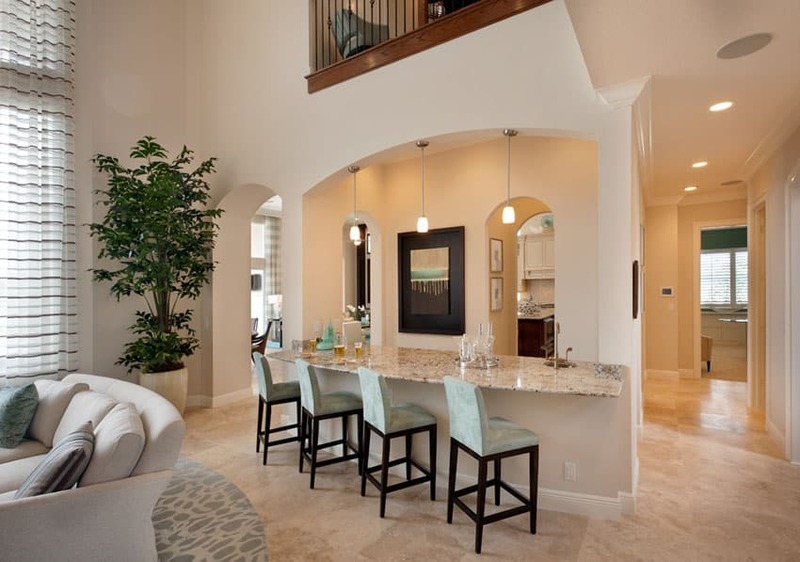 Here is another example of bar located in the main living space of the house. 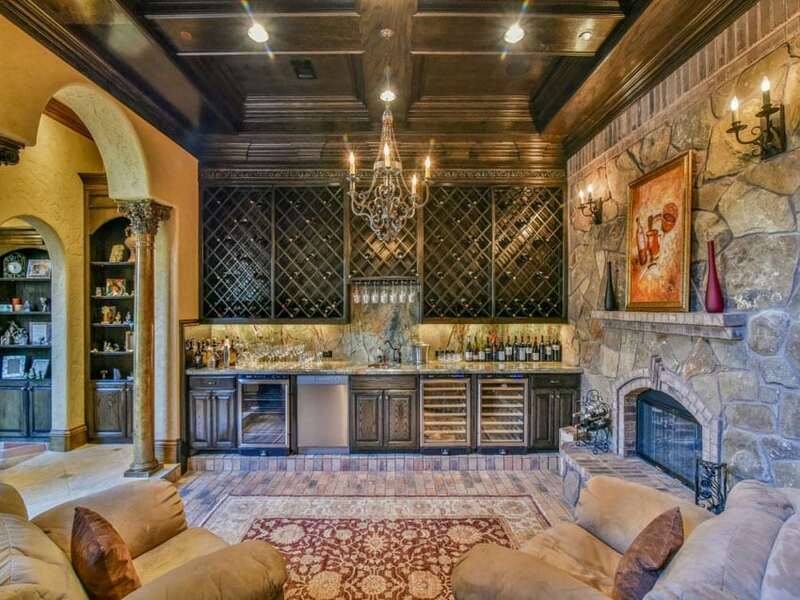 Home bars located near the front door of the house serves a secondary purpose of being the “face” of the home; in this design, a faux brick pattern on the bar’s back wall creates an air of mystery and rustic charm only further complemented by the use of an ornate gate usually used outside with a bright pendant light behind its bars. Sometimes, the design of custom home bars truly shines not with the features it has but by the openness and airiness of its negative space. This simple yet undeniably spacious design houses a simple two-seater bar counter and a pool table with stylish wooden plank floor boards and tan-painted walls. The most noteworthy feature of this space is its rounded and ornately-patterned steel ceiling; the simplicity of the space serves as the perfect backdrop for such an interesting design feature. 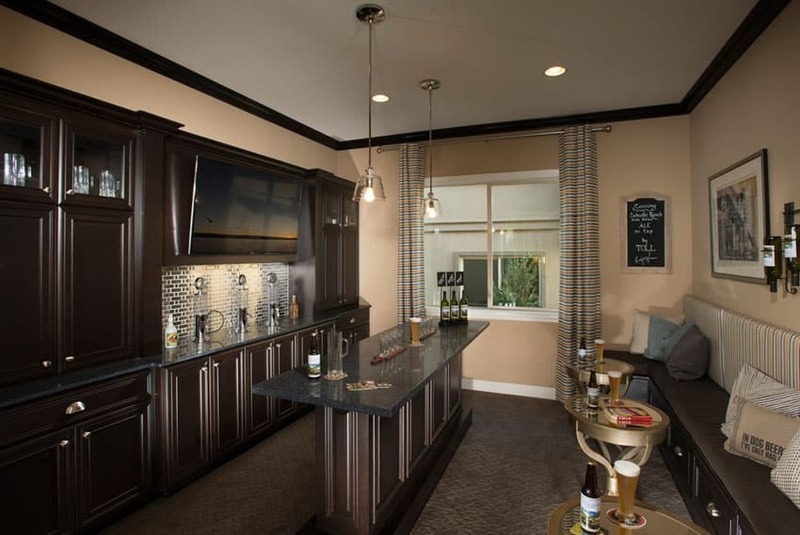 For more home bar ideas visit this gallery page.